With StrategicCloud Services from Strategic Technology Associates, using, upgrading and maintaining your IT has never been simpler. Your technology, software and applications are hosted by our team of experts, which means you can eliminate the cost of investing in new infrastructure, licensing new software and training new employees - saving you money and letting you focus on your business. StrategicCloud Services from Strategic Technology let you harness the power of your office intranet and Internet to increase efficiency, enhance communication, inspire collaboration and simplify teamwork. Hosted Apps - Collaborate in the cloud to enhance marketing, sales and customer service with leading software that fits your business. Office 365 - Improve communications with business e-mail and collaboration tools including shared calendars, tasks, contacts, public folders and e-mail. For mobile use, add on BlackBerry, iPhone or Android devices - for one low price. These powerful solutions can be designed to meet the unique requirements of your company. 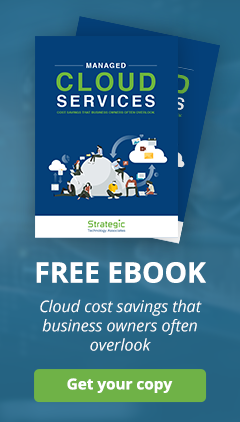 If you could benefit from increased market share, greater efficiency or a better bottom line, Cloud Services from Strategic Technology are the answer. Get started with StrategicCloud Services from Strategic Technology today!